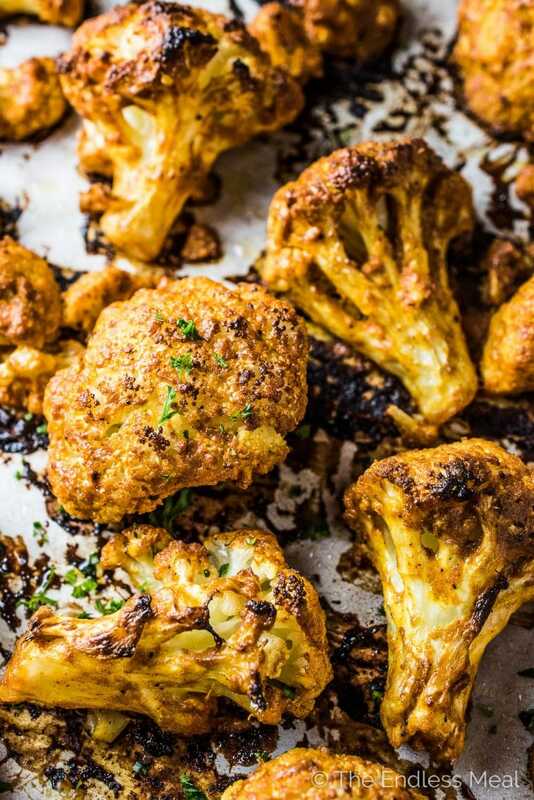 Roasted Tandoori Cauliflower = the BEST cauliflower recipe ever! The DIY tandoori paste is made with yogurt and staple pantry spices and is so flavorful. 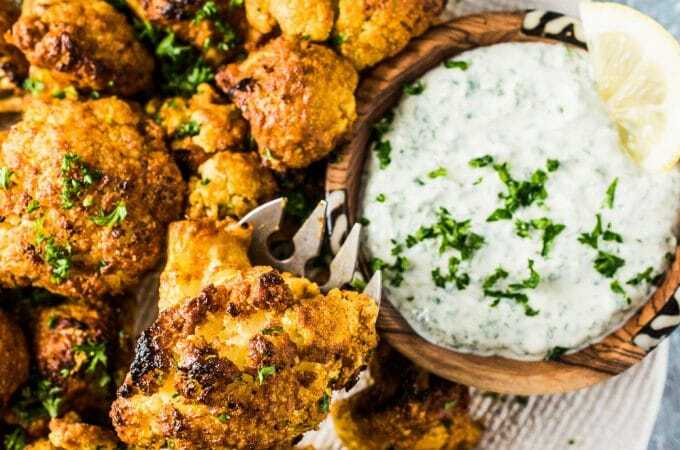 Serve the delicious cauliflower with an easy to make tahini cilantro sauce for a healthy and crazy delicious side dish recipe. Calling all cauliflower lovers! I've found my favorite cauliflower recipe and I'm sharing it with you today. This roasted tandoori cauliflower has won my heart. Calling this my fav cauli recipe is a big thing. There are no less than 14 cauliflower recipes on this blog, and that doesn't include recipes that call for things like cauliflower rice as a side. We're kind of cauliflower obsessed over here. Are you the same? The warm Indian spices + the roasted cauliflower are all things dreamy. The DIY tandoori paste is super easy to make but leaves you feeling like the master of your kitchen. You can batch make the tandoori paste to make it even easier to eat tandoori cauliflower all week long. The tahini-based dipping sauce is kind of insane. Its gentle flavors are the perfect match for the bold spiced cauliflower. See that bag of cauliflower up there? That's what it looks like when the tandoori paste nestles its way into every cauliflower nook and cranny it can find. After mixing some yogurt (or vegan yogurt, your choice!) with a few Indian spices and some lemon juice, you pour that DIY tandoori paste over the cauliflower. Give the bag a little shake then set it aside to marinate. I like to make the tahini sauce as early as possible to give the flavors time to meld. The sauce definitely gets better after about a half hour of rest. ← I get better too if I've had a half hour to rest. ? When you're ready to pop it in the oven simply dump the cauliflower onto a baking sheet (lined with parchment if you like easy clean up) and put it in your oven. If you love this Roasted Tandoori Cauliflower as much as I do, make sure to give it a 5-star review in the comments below! In a medium-sized bowl, whisk together all the DIY tandoori paste ingredients. 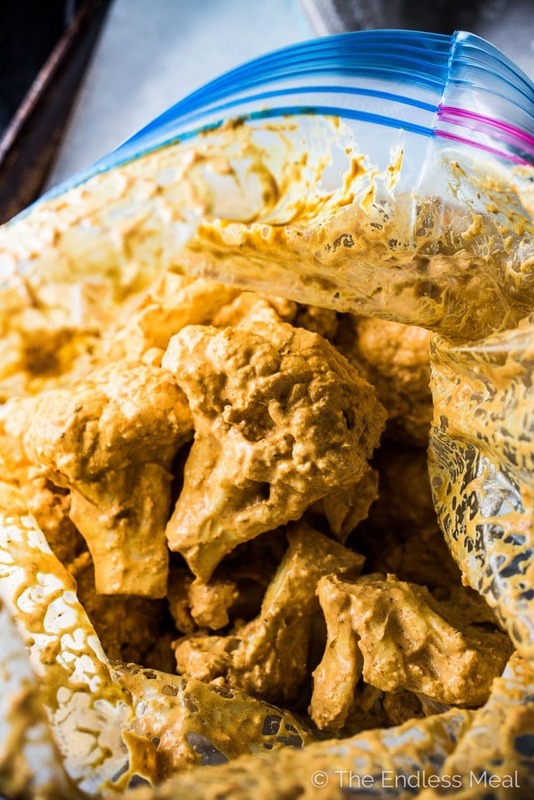 Place the cauliflower florets in a resealable plastic bag and pour in the DIY tandoori paste. Close the bag and shake it so that the cauliflower is completely covered in the tandoori paste. Set the bag aside for a 1/2 hour or in your fridge for up to 24 hours. Make the tahini cilantro sauce while the cauliflower is marinating. In a small bowl, whisk the yogurt, cilantro, tahini, lemon juice, garlic, and salt. Add enough water to thin it to a dipping sauce consistency, about 1/3 cup water. Preheat your oven to 400 degrees. Line a baking sheet with parchment paper. Empty the bag of marinating cauliflower onto the baking sheet. Roast in the oven for 40 minutes, tossing halfway through. 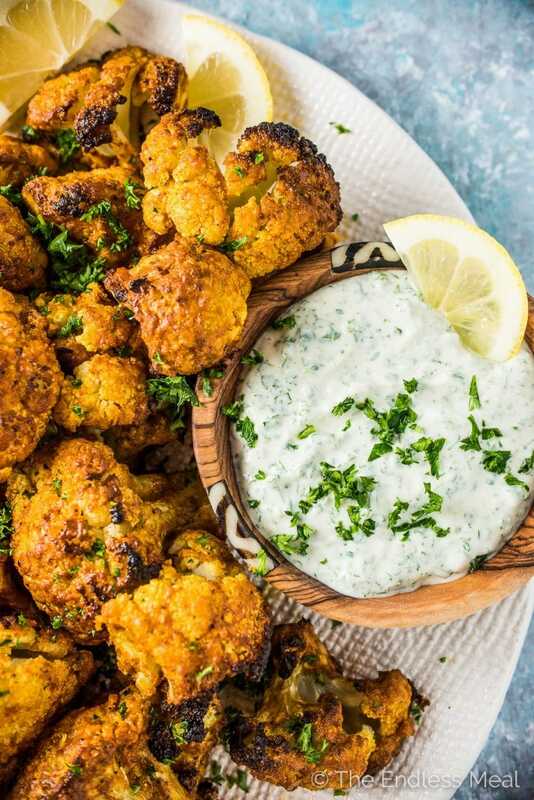 Serve the tandoori cauliflower with cilantro and lemon slices and the tahini cilantro sauce on the side. The DIY tandoori paste is quite flexible. If you don't have all of the spices, don't fret. The most important spices for flavor are cumin, coriander, turmeric, and garam masala or curry powder. The paprika adds mostly color. This is definitely the best roasted cauliflower recipe I’ve ever made! And the sauce…don’t even go there! Insanely addictive! I make about 5 times the quantity! What kind of yogurt? I’m assuming plain ‘flavored’ yogurt but would it be Greek yogurt or normal yogurt? Excellent recipe! Thank you, we loved it and will make it often. Best cauliflower ever. Next time I’m doubling the recipe as I could have eaten the whole batch myself lol. Fantástic tandoori paste. We used it to marinate some turkey breast chunks and cauliflower, then pan fried it because of the meat… really delicious and flavourful. SO love your recipes, thank you!